Providence Perfume Co released a new collection of natural fragrances in October, which was good news for any fan of this "indie" company. The collection includes six perfume oils: Rose 802, Orange Blossom Honey, Summer Yuzu, Ivy Tower, Sweet Jasmine Brown and Violet Beauregarde. I've sampled three so far, and I hope to get to the rest this week. Here are my quick thoughts on Rose 802, Orange Blossom Honey and Summer Yuzu, written during a gloomy spell of early-winter weather when I really needed a fragrant pick-me-up. Rose 802 is a floral with woody and gourmand notes — rose, black currant, cedar wood, fir, vanilla, bergamot and myrtle. (The "802" is a reference to Vermont's area code, since the scent was inspired by summer travels to that region.) I generally enjoy rose-centered "fleurmands," and I like this one, although it took me a few tries to figure out. For one thing, it has less fruitiness than I expected. I also smell a "doll's head" note that must be the vanilla, although it also reminds me of heliotrope or perhaps maltol. The woods come out in the base, and the fir-needle oil lends an interesting balsamic green accent. This mix of sweetness and outdoorsy-ness feels bohemian — Rose 802 is unconventional, yet comfortable. Orange Blossom Honey includes notes of honey, vanilla, neroli, balsam, tonka, orange blossom, ginger and sweet orange. I expected this fragrance to be sunny and bright, but it actually felt duskier and spicier on my skin. It reminds me a bit of Providence Perfume Co's older release Ginger Lily, in the way that its ginger and some mysterious musky note tend to rough up the more delicate white floral notes. There's also a spicy-sweet element that reminds me of brown sugar. If you like your honey-inspired perfumes a little earthier and more unisex than something like Aftelier Honey Blossom, you might love this one; in the indie-honey sphere, it has more in common with Illuminated Perfume's To Bee. Summer Yuzu is the cheeriest scent of these three. Its composition of sunflower, cedrat, aglaia blossom, yuzu, tomato, pink grapefruit and frankincense is citrus-packed, and it opens on a refreshing, tart note that's like a hybrid of lime, orange, and mint. I think I can catch some greenish tomato leaf in the fragrance's heart, rather than tomato fruit. The dry down is a very pleasant mix of more rounded citrus and a soft, woody-sweet balsamic note (from the frankincense). Summer Yuzu definitely lifted my mood a bit on a particularly dreary day. 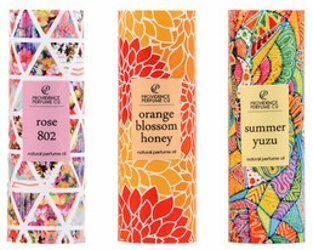 These perfume oils are packaged in white glass roll-on bottles with colorful outer wrappings — or tubes? I haven't seen them in person yet, but their designs look great in photos. Due to their more intense concentration, they have decent staying power on skin (although Rose 802 far outlasted Summer Yuzu, just due to their differing compositions). I look forward to discussing their "siblings" Ivy Tower, Sweet Jasmine Brown and Violet Beauregarde soon! 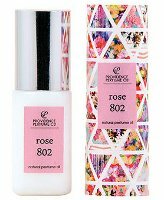 Providence Perfume Co Rose 802, Orange Blossom Honey and Summer Yuzu are $50 each for a 5 ml Perfume Oil rollerball. A sample set is also available. For purchasing information, see the listing for Providence Perfume Co under Perfume Houses. All of these sound very nice (looking forward to hearing about Violet Beauregard) and yet I’m not tempted at that price point, for oil. Oil barely radiates off my skin at all. Not judging here, I just know that I’ll probably be frustrated by it. For reference, I paid about $28 for 10ml of a BPAL oil and was disappointed with that too. Though, come to think of it, I loved DSH La Fete Nouvelle better in oil than in the EdP (I own both). Hmm. Still, these are a little outside my budget. Oil is definitely “ymmv” as a fragrance carrier! It works pretty well on me… for some brands. BPAL’s oils usually disappeared from my skin in about 20 minutes! I have always wondered about oils. Do most people enjoy oils better than perfume or vice-versa? I am the type of person who wants my fragrance to stay on all day. Oils to me just sounds like it would be messy. Love to hear what others think. The Orange Blossom Honey sounds great to me. I’m a fruity gal! Generally speaking, oils tend to wear closer to the skin and depending on their composition, can last all day and them some. I like them because I notice that oils meld with the skin just become “part of you”, if that makes any sense. Haven’t noticed that they’re especially messy, all you need is a few strategically placed dabs, and you’re good to go! I don’t think they’re messy, either — most perfumers choose oils that will absorb easily into the skin. I do like the experience of dabbing or rolling an oil behind my ears, onto wrists, etc. Perfume oils tend to have less “sillage,” as Sayitisntso pointed out, so they’re also good options for the workplace or other crowded environments. There’s such a variation with oils on my skin. My Rasasi and Monyette Paris oils easily last all day, my sadly now rather vintage TBS oils last several hours, but most of my indi/etailer oils tend to fade after a few hours or less. Maybe it is the carrier oils, maybe the fragrance oil concentrations. I don’t know. But I rarely have problems with them being messy. Some I need to rub in a bit after applying (particularly the Rasasi oils, which require a good rubbing together of wrists etc.) but once that’s done, they generally stay put just fine. That yuzu one sounds lovely. I may need to try that one. I was surprised by how much I liked the Yuzu — I’m not usually a happy-fruit person, but this one is very nice! I’ve never tried a perfume oil but these sound lovely, and the packaging is so bright and cheery. The rose one is calling my name: rose, woody, gourmand, mix of sweetness and outdoorsyness – sounds like me. And I love Vermont! Definitely adding this to my must-try list. I really like the rose — Robin found the natural rose note a bit plasticky-sweet for her taste, but I like it on myself! I still need to make a visit to Vermont somehow. Want to try the orange blossom:). I hope a sample will come your way somehow!